Career Jam is a hands-on, career exploration event for all area 8th and 9th grade students! 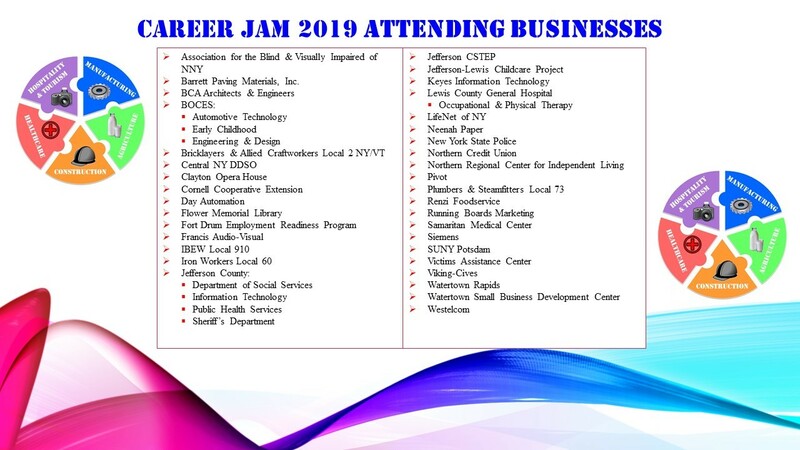 Career Jam will be held on the Jefferson County Fairgrounds in Watertown, NY. Representatives from several major business sectors, including Agriculture, Business, Construction, Healthcare, Hospitality & Tourism, Human Services, and Manufacturing, along with a number of North Country training institutions, will demonstrate and offer hands-on career-related activities for area students to explore.